The two-channel Vibrolux Reverb has separate Normal and Vibrato channels, two 10" speakers and two 6L6GC's in the power section for a 35 watt power rating. In some circles, the Vibrolux Reverb came to be known as the 'poor man's Twin'. This particular amp has been fitted with new-old-stock Mullard tubes and the two original 10" Oxford speakers were replaced with Eminence Ragin Cajun and Copperhead speakers. Fender turned to Oxford speakers when Jensen, their original supplier, stopped producing speakers for the musical instrument industry in the late '60s. 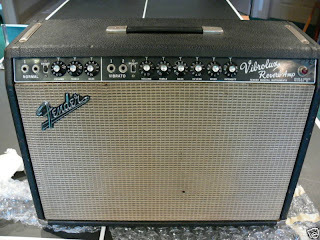 According to the seller, the amp was serviced by Bob Bradshaw at Custom Audio Electronics, and other than some new capacitors, no tone modifications were made to the amp. Dude! You're finding some amps this week!! When are you gonna register an affiliate account with eBay?! I'm gonna pitch this one too!!! I applied but was rejected :( No specific reason given. Oh well..
Clinton, Keep building up the content and rank, and re-apply every 30 days or so. You are movin' up so they'll reconsider. Keep makin' friends out there in the music blogosphere and gettin' link backs! Peter at i heart got approved, you shouldn't be to far away from it! Thanks JP. Sincerely, you're a gem.